Great Potato Soup Recipe for homemade potato soup tastes great. In this video we will show you step by step how to cook an amazing pot of potato soup using bacon to bring out a unique flavor. Also in this recipe. No fat half-and-half cream is used to induce a creamy taste. You won’t find in most potato soup recipes. The Bald Chef shows you step-by-step instructions on exactly how to make some of the best tasting potato soup you’ve ever had. Give this recipe a try and you will certainly find it to your liking. 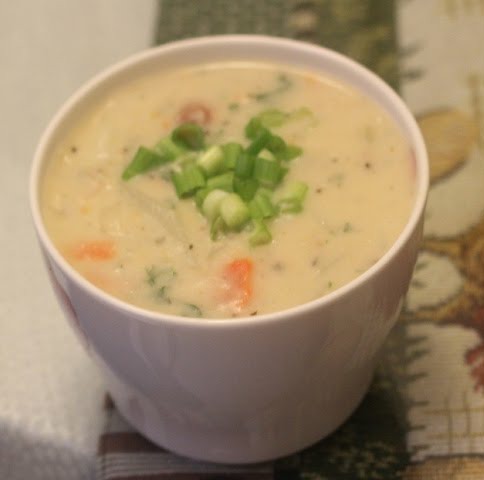 What I great meal this homemade potato soup would make for your family. 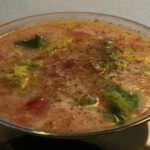 Unlike many other potato soup recipes you’ll find this is very easy to make, and makes any canned soup from the grocery store taste absolutely different than his homemade recipe. The following is the recipe for this homemade potato soup. Start out in a stock pot by frying 6 slices of apple smoked bacon, when the bacon is fully cooked, remove it from the pot. Chop up your peeled carrot, onion, and celery, and set aside. Bring your pot up to medium heat and add 1 tablespoon of butter, then place your vegetables into the pot and cook them until the onion is translucent. At this point add 1/2 cup of flour and slowly stir the mixture to create a Roux. When the Roux is cooked add your 32 ounces of chicken broth and continue stirring the stock until thoroughly mixed. Add all above-mentioned spices and cook with your 4 cut up potatoes for about 12 minutes. At this point add your chopped up bacon, 1/2 cup half-and-half, and you’re 4 tablespoons of chopped parsley. Cook the potato soup until the potatoes are tender. Ladle the soup into a bowl and garnish with your thinly sliced green onion. This is very good I combined some condiments from another u tube recipe this is very good I cook my potatoes a little longer to get softer though. Oh man a really good tater soup. I leave the skin on my russet taters and I have also left the skin on the red taters. I’ve also added a cup of wine as I sautÃ©ed the onions, garlic and onions. Brother you got to try that with the skins on the taters and white wine. I enjoyed your recipe for this Potato soup! loved your seasonings and herbs! I am not a fan of Fat Free anything LOL! As in your Half n Half, Just saying! I love the richness of whole cream products. But…. your soup looked amazing & I will give it a try as I always do with your wonderful recipes. Thank you Chef Glenn! you have shared some great tips on a very warm and welcoming recipe.thank you. Delicious! a good warm hearty soup.